What are mostly come up to your mind to spend your leisure time in weekend? Do you think about traveling? Hiking? Sun Bathing? Such of fun things to do. But wait, what about the budget? Looks like it really will deplete your money for the transport cost, food, entrance ticketing, and another necessities. Then, what about the time? Travel away from home obviously needs extra time, and difficult to manage in short weekend. Last further, what about the energy? All of the time you spend away home exhausts your energy, making you desire an extra time to rest. Yep! You need to think twice about traveling in weekend. Because what you will spend during travelling are not only fun liveliness, but also money, time, and energy. Yet still, staying inside your home and doing nothing is literally a boring holiday activity that you ever did. You should find another pleasant action, which is affordable and not consume too much energy you need to set aside for Monday’s life. Though, don’t think too hard, here we come to show you a fascinating activity that you might never thought before. 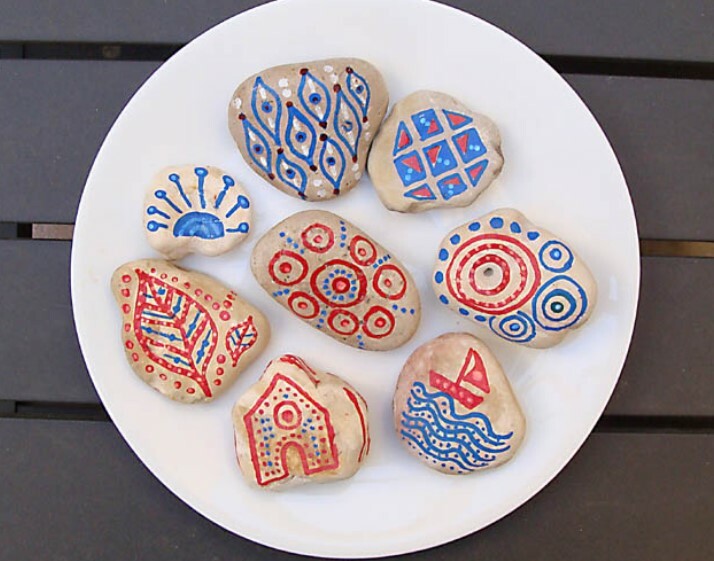 ‘’Rocks painting’’, perhaps sounds odd, anyhow this is extremely recommended to try. 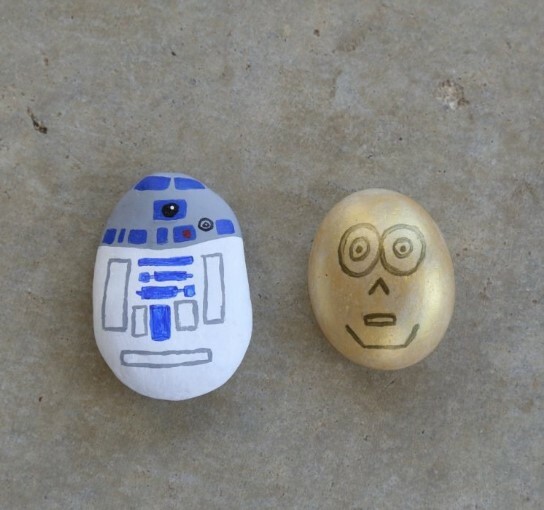 We guess you never try, or even think, to paint rocks around you. 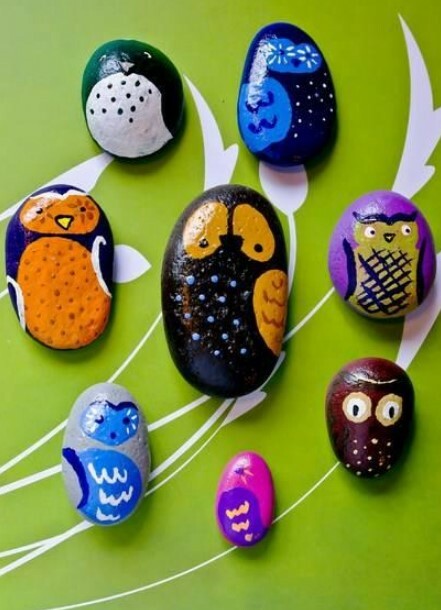 Nonetheless, rocks painting will bring you to a delightful time among you and your families. 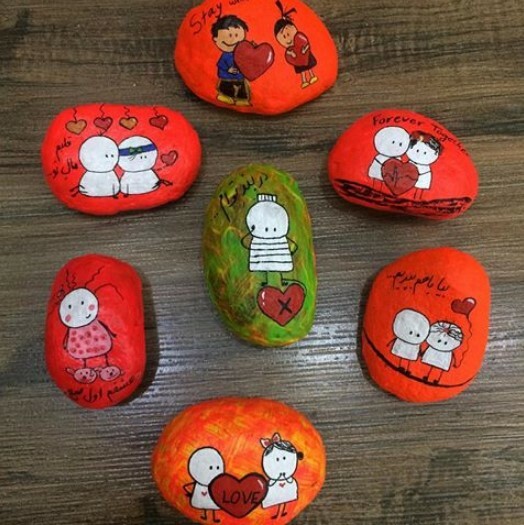 Unwittingly, painting rocks side by side with your families brings you closer to them, by creating a little happiness and building an intimate relationship. Even kids can get involved in too, and this is might be solution for you of your difficulty in building chemistry with your children. Collaborating with you, your children increase their art skill which most likely gives positive impact for their brain. 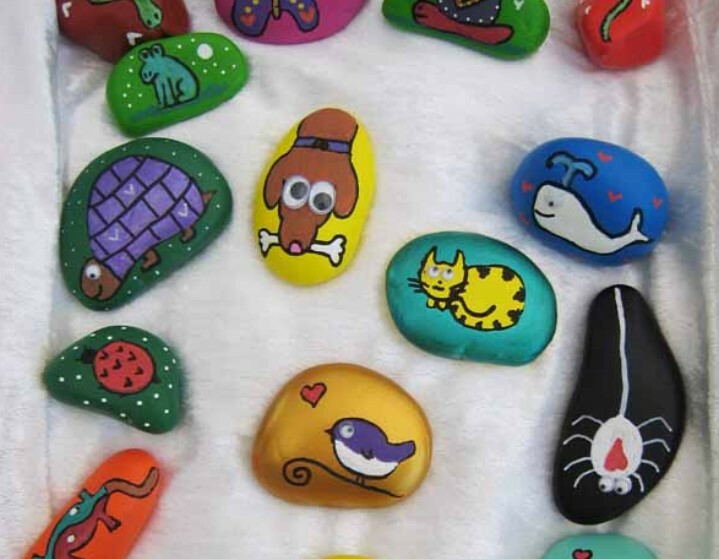 Moreover, not only refresh children’s brain, but rock painting also foreseeable refresh your mind. Escaping from your boring daily work, you can express any feeling and throw away your stress by doing something using your right-brain. In the end, you will be surprised by your own creations and find such an astounding feeling in turning ordinary and useless things to be extraordinary. After preparing all of the stuffs, the next step before weekend is preparing your imagination and energizing your readiness to welcome the weekend attraction. First of all, prepare the rocks. 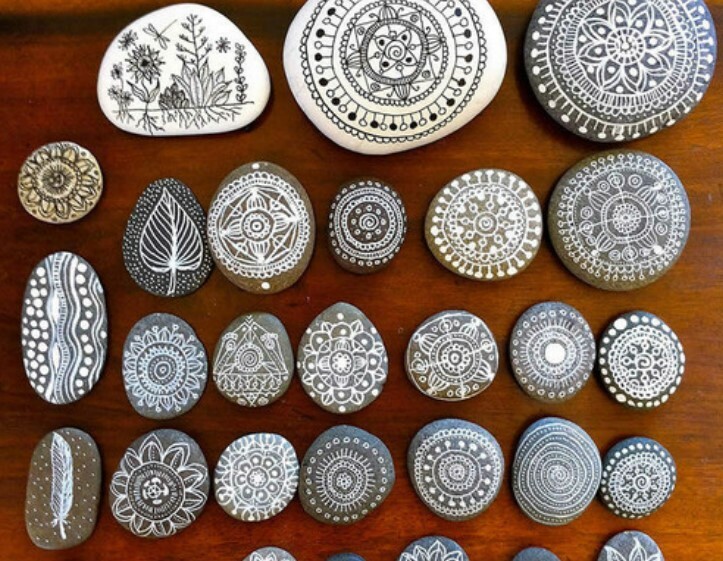 You may decorate any rocks you want, but sure would be difficult to paint in ridges rocks. So we extremely recommend you to take smooth and flat rocks. Second, you need to seal your rocks using a clear brushes or spray sealer. This way may prevent your marker become easy to be spent because sucked by the porous rocks. Third, play your imagination, throw away all of your burden, express your creation on top of the rocks. You may use several coats, but be patient to let them dry layer by layer. 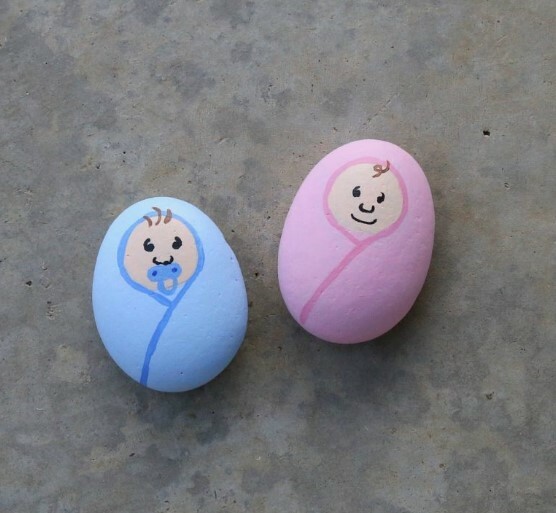 The last, finish your extraordinary rocks with two or more coats of outdoor sealant. 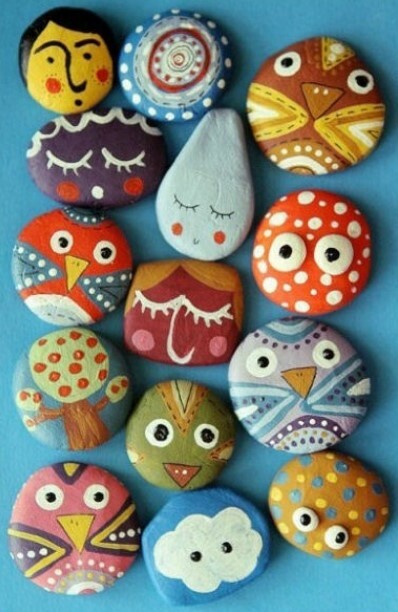 In the result that your great painted rocks will be long last and protected from any elements. Soon try it with your family; sure it will be tremendously fun. 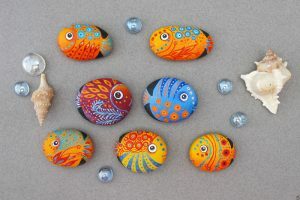 In addition, your painted rocks will never be useless, because so many things you can do with your extraordinary rocks. 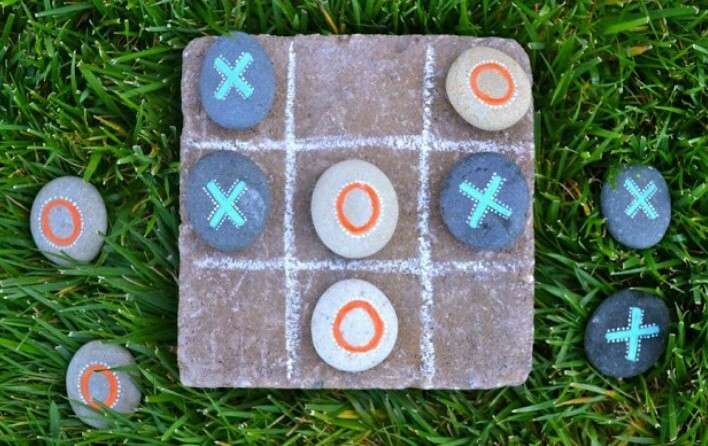 You can use it for domino rocks game, tic-tac-toe rocks, rock magnets, garden markers, paper weights, pet rocks, and even for kids’ educational purposes such as learning numbers or alphabets, also many more splendid things. 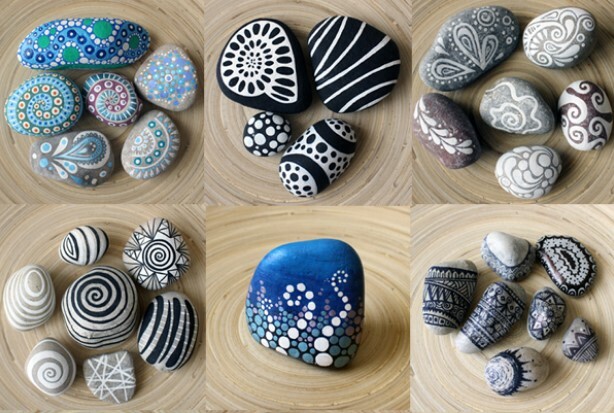 Well, the last yet never least, here you can see 50 painted rocks ideas to stimulate your imagination. Enjoy and choose your favourites! Playing with abstract touching and spilling out all colours combination will make you feel free. No rules, no limitation, and no thinking too much about artistic, just randomly draw dots, lines, or whatever expressions releasing tension. Cute! 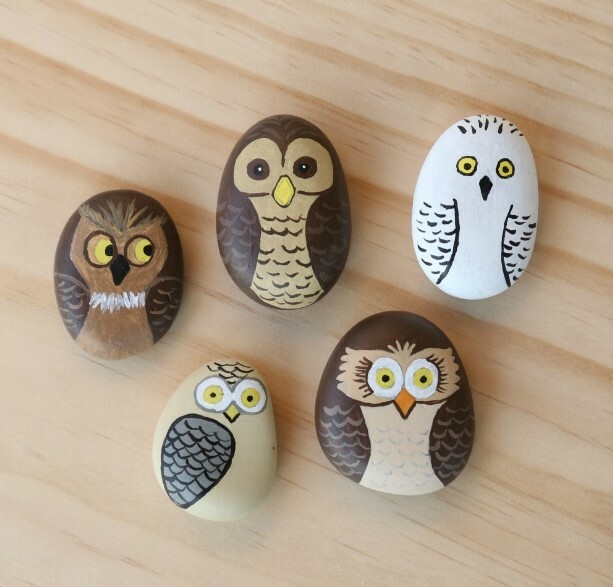 Make it by putting simple owl sketches, inlaying with matching colours, then add dots, lines, or any feather-like decorations. Paint a heart and beautify them as your artistic soul roaming. It’s going to be sweet to present these handmade stuffs to your partner. Heart-shape also could give different impression other than sweet. With intricate bohemian designed and integration of neutral colours, it looks more sophisticated. Monochromatic designed could be one of some good choices paint to bigger rocks. 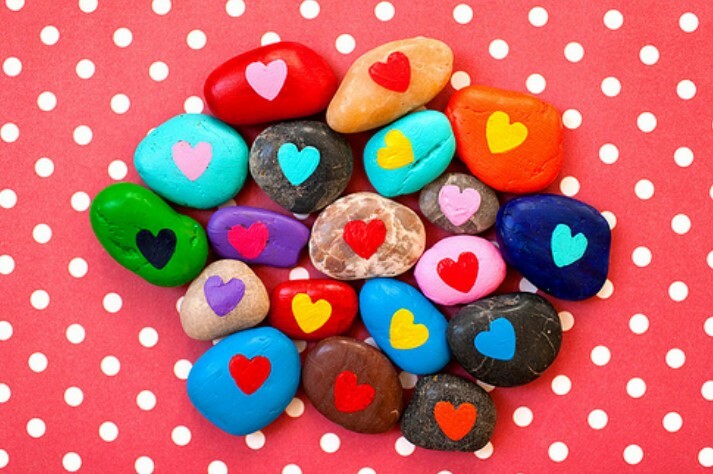 Pour your playful imagination on colourful stones with heart image in the middle. It could be cute, sweet, and simple. These funny monsters with magnet on the behind look cute as well as spooky. Your little boy will be happy to work with it, then proud him by showing that his creation could be tremendous ornaments for the fridge. 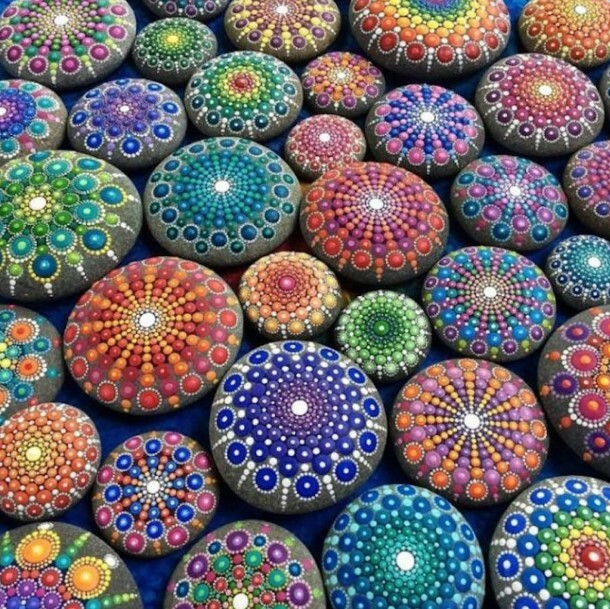 If you love detailed and have fine art talent, drawing elaborate pattern in pebbles would be easy and fast. Simple, funny, and colourful, this concept only needs you to draw whatever you imagine or write a letter that you can arrange to express a word. 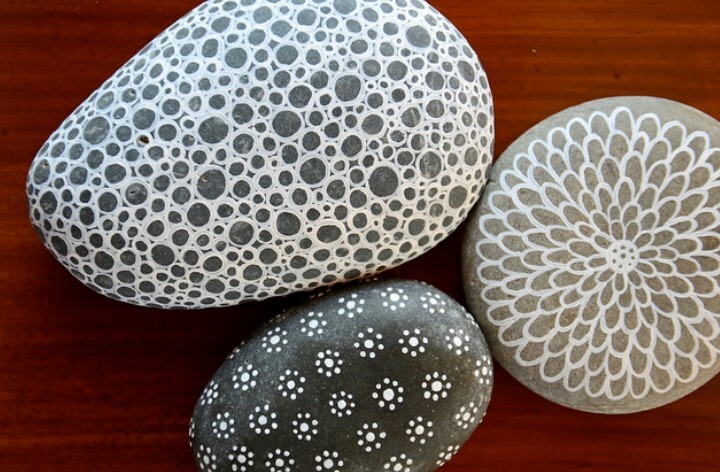 Combining some lines and dots to shape spirals, circles, or other abstract shapes will result a simple doodle to adorn the garden. Colourful animal cartoons also could emblazon your home. 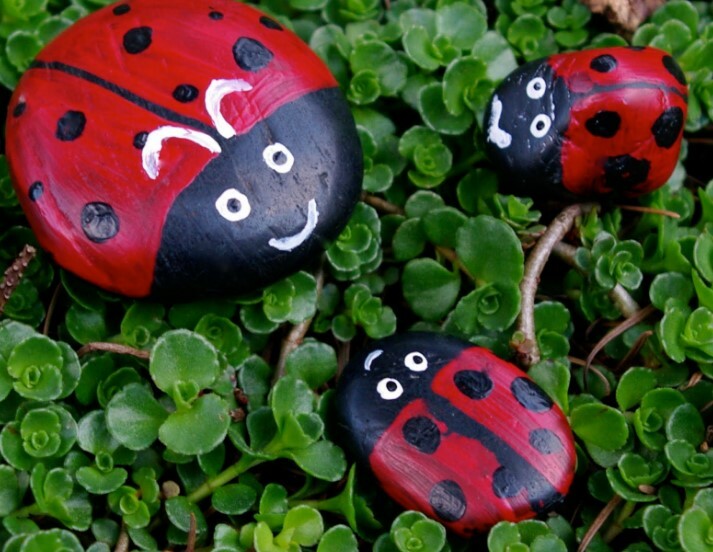 Just draw bugs in some rocks to beautify your flowerpots or funny pets to be adhered to your fridge. 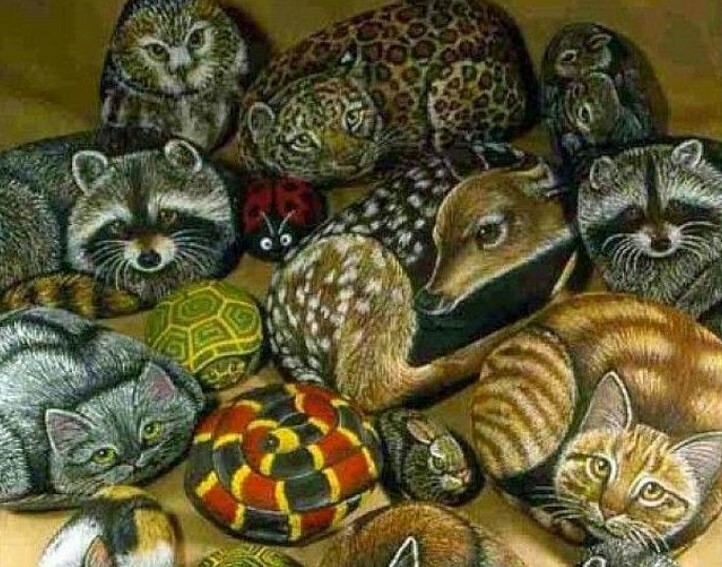 If you have such of those painting talent, you can use the rocks for your new canvas. Arrange it in your living room and amaze people! Interesting! You can send message to your family in the home. 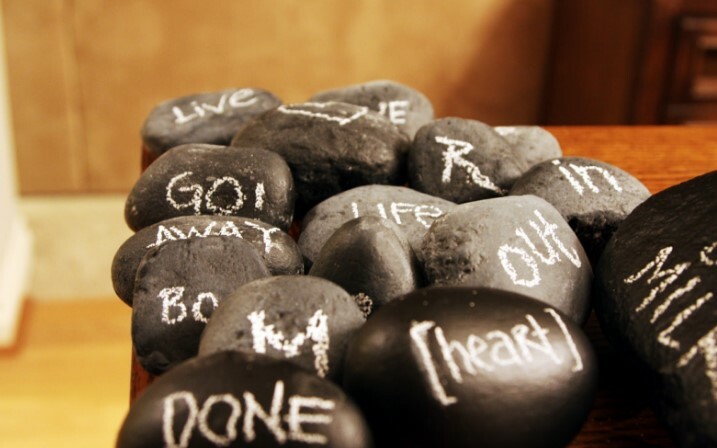 Coat the rocks with blackboard paint and write your message with a chalk. Rock will be conspicuous to be a message media. 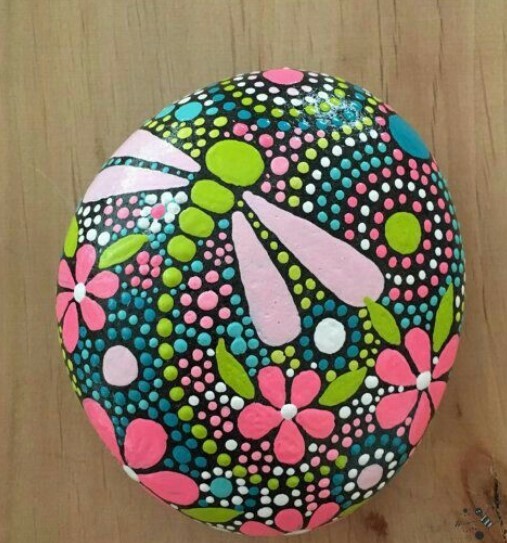 Ladybug painted rock! This one is cute to complete your garden decoration and just need black-red paints. Your garden will be fascinating with some adorable game kit. Your children can play it while you have a relaxed chat with your mate. 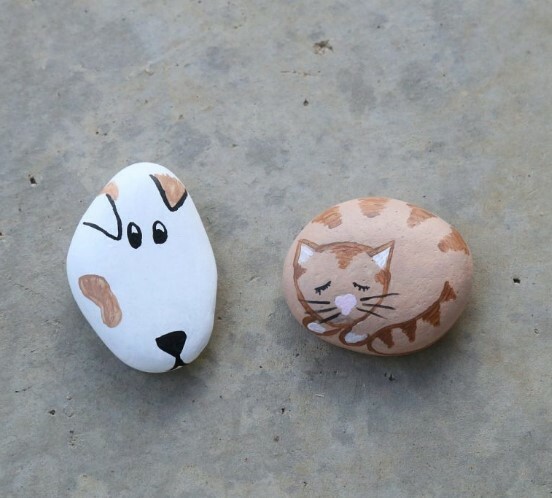 Invite your children to draw a pet on the rock as complement in their room decoration. They will happily play with it while training their artistic skill. Decorate your baby’s room with mini cute babies. Simple, sweet, and easy! This design will be perfect to embellish your boy’s bedroom. 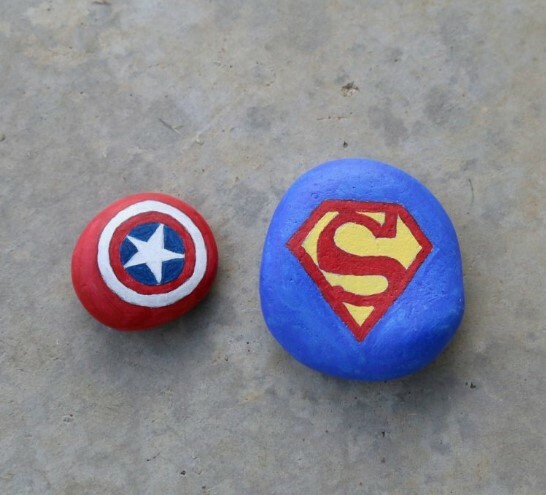 Match the room nuance with superhero theme also. Simple but sophisticated, also very fit for your boy’s bedroom who really love this movie. Such a hilarious character with a nice colour combination! 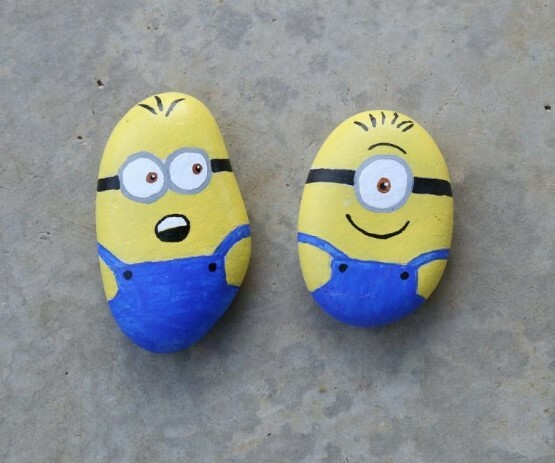 Imagine you make it so many, and display them on your cabinet like you are Gru. 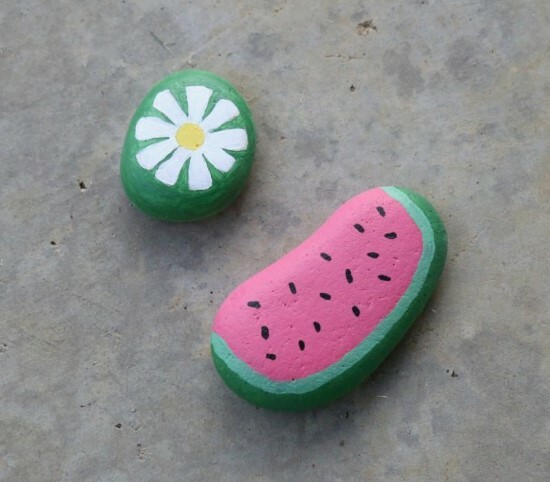 Summer is a good time for having watermelon, orange slices, and so many painted rocks fruits to beautify your dining room. Love sport? 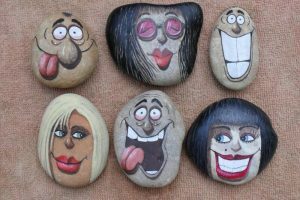 Decorate your room with some sport image stones. 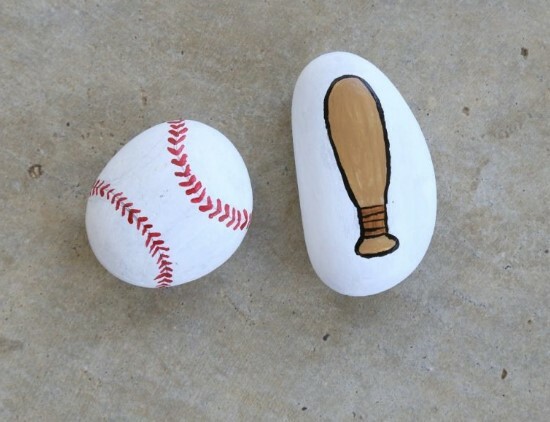 You can choose a round stone shaped to represent a ball, and paint it become a real-like ball. Fish! You can make many other sea creatures too, and create your aquarium like a seabed. 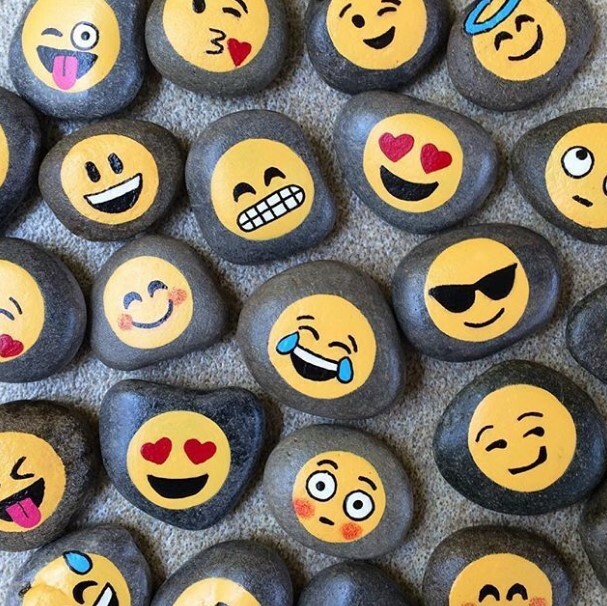 If your rocks are round, coat it with yellow and draw some emojis to be arranged in your living room. Trick or treat! 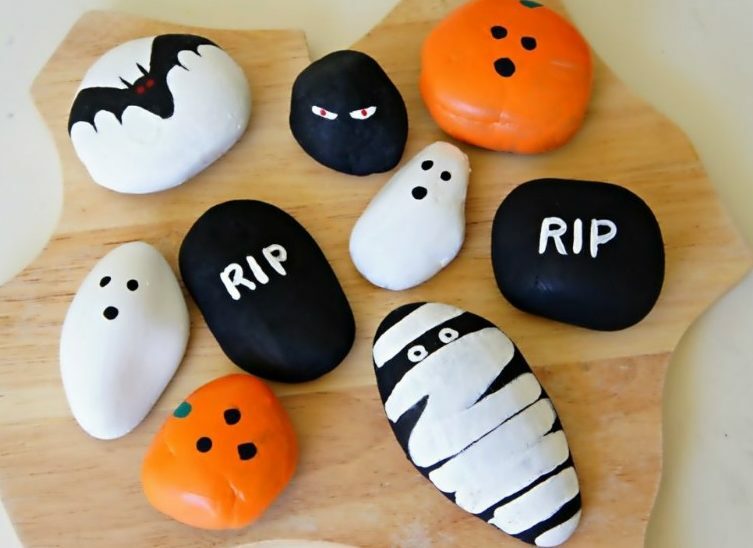 These rocks will haunt you on your Halloween. 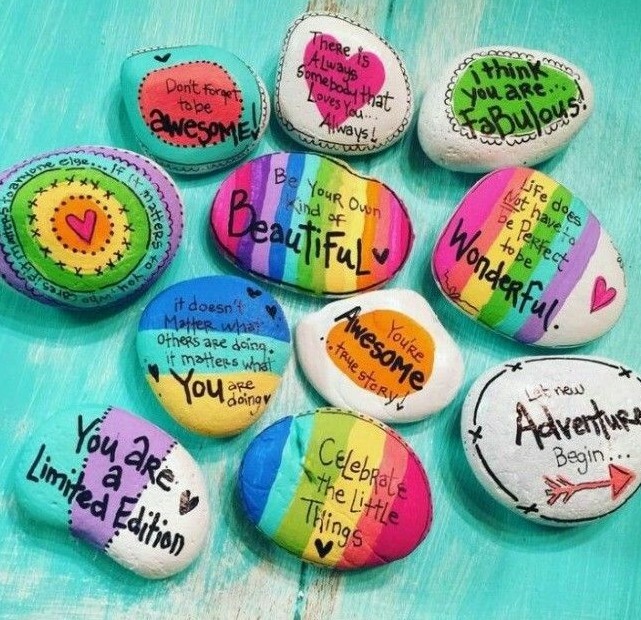 Great quotes on these colourful rocks obviously will motivate you. 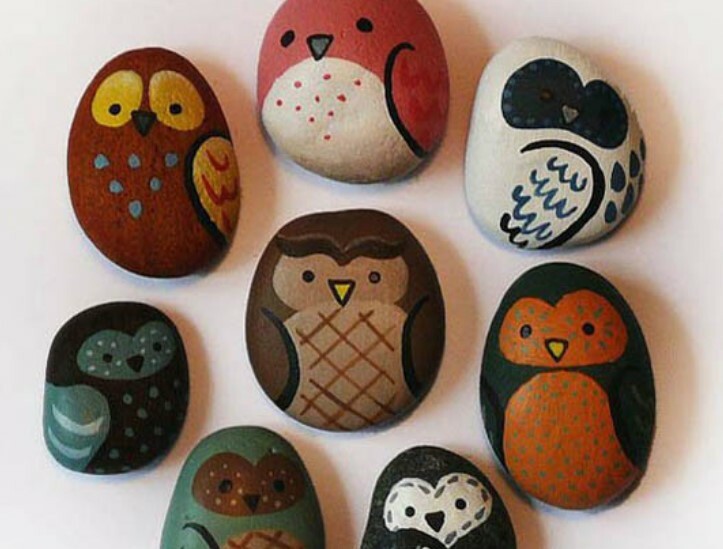 You also can draw an emoji upon the irregular shaped rocks. 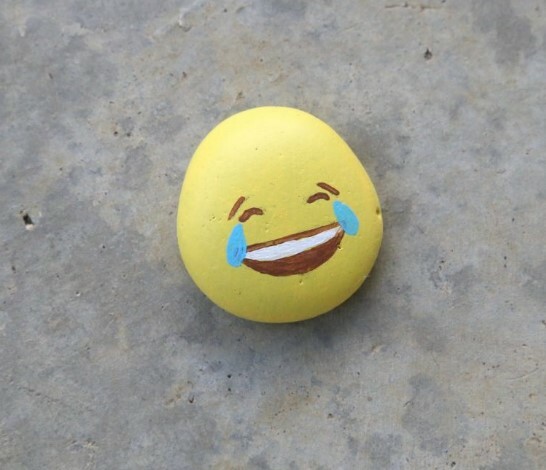 Instead of send an emoji in your chat, you can send the real one like these! Mandala art painting will result an elegant impression. Highlight the elegance by painting circle formation like pearls upon the rock. These randomly funny faces could represent any creatures or things you want. These will be a great complement to your winter celebration decoration. 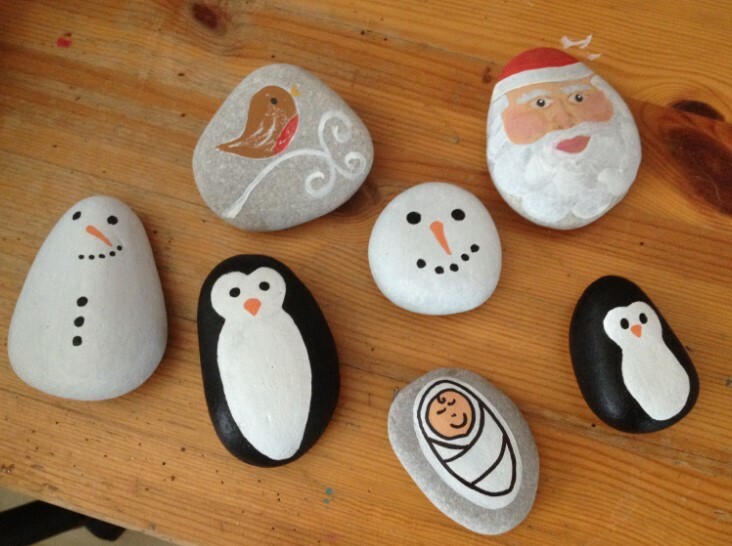 Display some snowmen, penguins, or birds next to the fireplace. Find some round stones then paint monster faces upon them. It will be match for your little masculine boy’s bedroom decoration. Mandala art is not always present an elegance, it’s also can express cheerfulness in spring theme like this one. 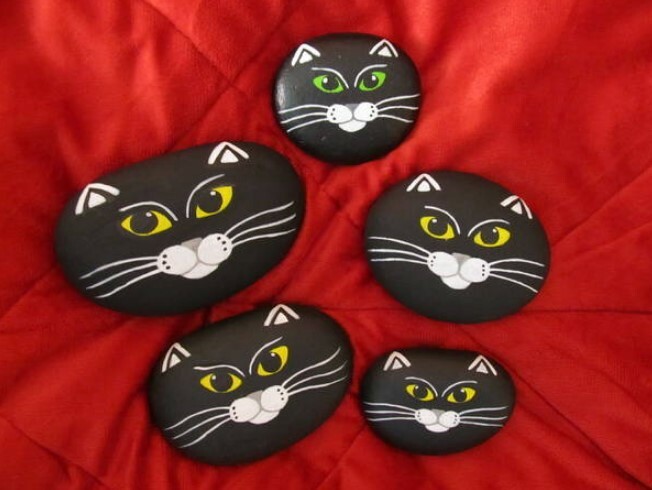 In thin rocks you can make black cat head, by coating it with dark black and paint the face with white, then add bright colour to make conspicuous eyes. Your teen will be good on this. 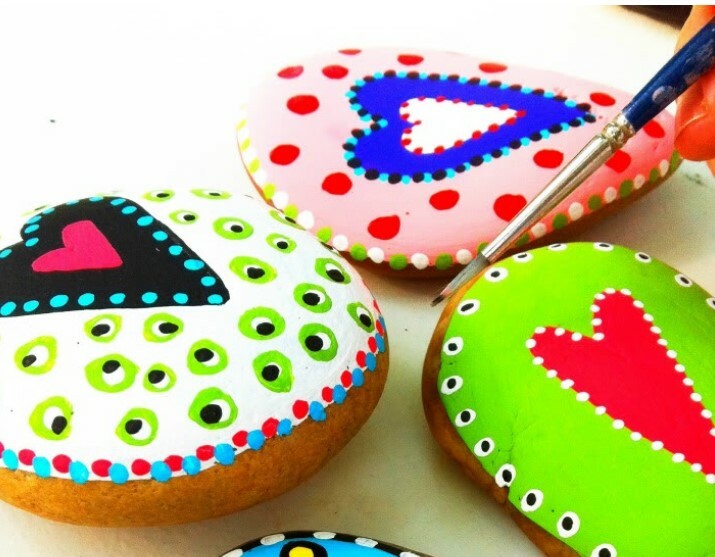 Just invite them to express their feeling or create everything they want using the painted rocks. This sweet design will be a lovely gift for your love one. Choose fine colours and draw some flat images represent your feeling. 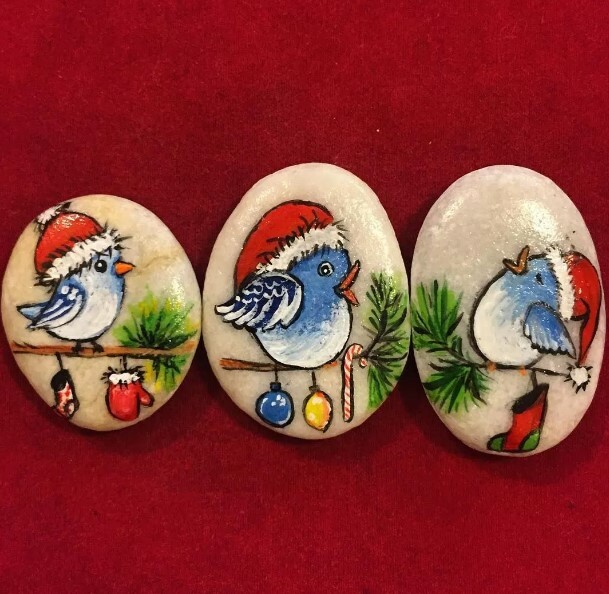 These winter birds wearing red hats will be a perfect decoration in your family room. 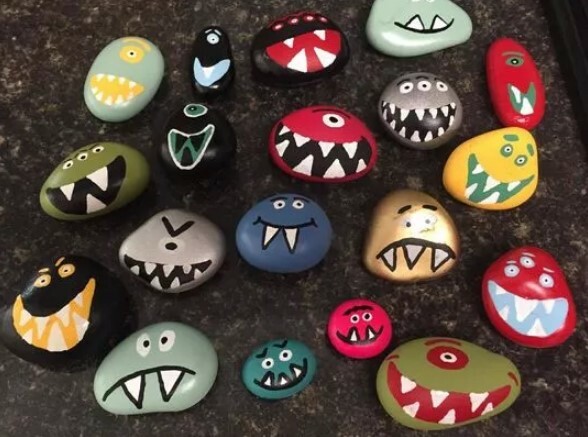 Instead of giving your friend a common greeting card, you can uniquely replace the card with these painted rocks. 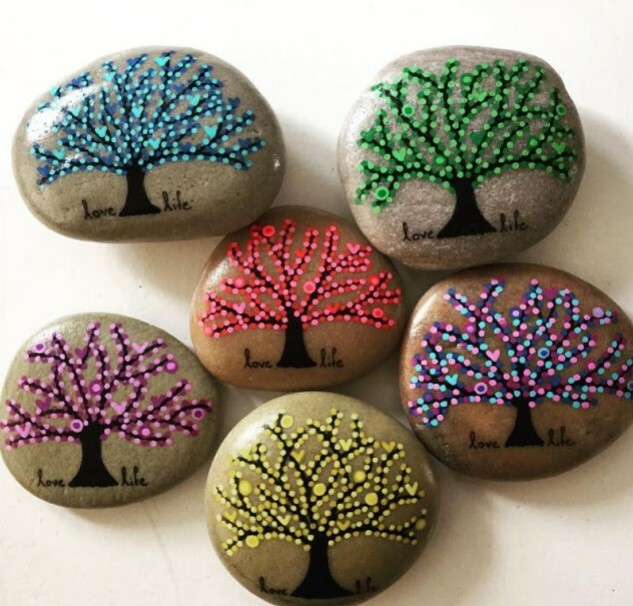 Colourful neon trees also can be shine on your rocks. Combine dark and light colour in the same tone and you can make it looks shining. Ever addicted with this android game? 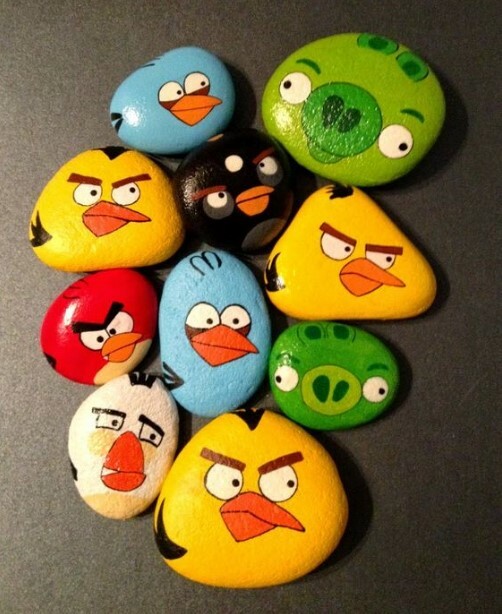 Now you can paint your favourite Angry Birds characters on your rocks. Copy these colour combination to create shiny-night scheme. Some of them even look like Milky Way and aurora. 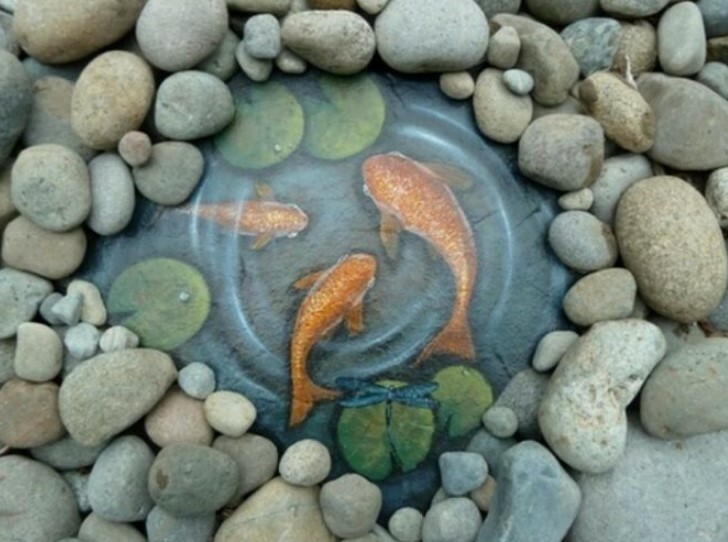 If you have a very big useless rock, pull out your great painting skill to paint some fishes and lily pads then surround the big rock by small rocks. Now you have an artificial pond! This type of owl needs a little more painting skill to make it almost similar to the real one. 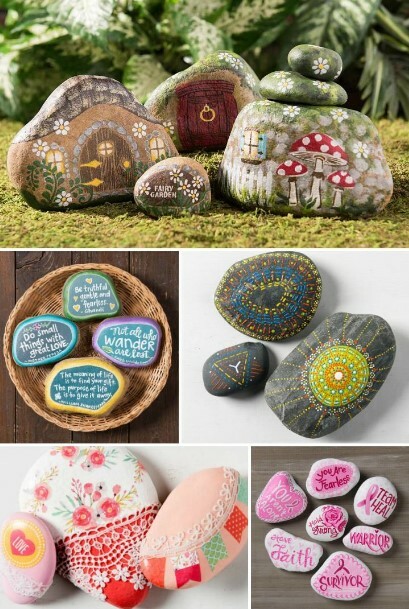 So cute to put fairy houses in your garden, and of course you can make the fake one using rocks. Probably a fairy will come and bloom the flower! Pour out all of colours, combine them all, and draw whatever you want in random imagination. Again! The cuteness attack! 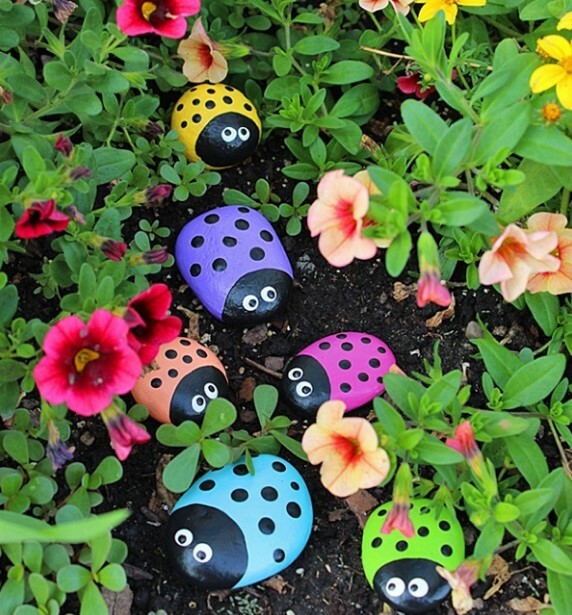 You can make ladybugs more colourful and spread them among the flowers. These scary monster faces could make your Halloween decoration more creepy and scary. Abstract arrangement of lines and dots will be so great if they’re made by a talented one. These birds are simpler and more colourful. Without needing any art skill, you just can mix all colours, lines, and dots to draw them. El Día de los Muertos or the Day of the Dead is one of famous annual celebration in Mexico. People usually make an ofrenda or offerings to the dead family, and decorate it by colourful skulls. 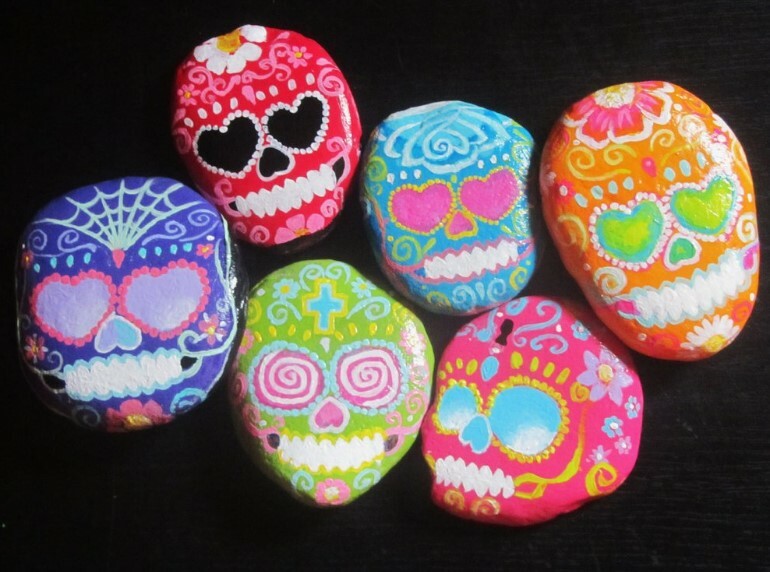 If you are Mexican, perhaps you want to put ofrenda skull rocks on ofrenda’s table? 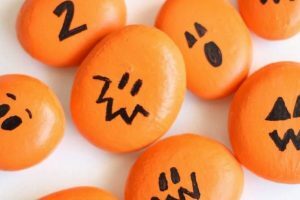 These designed is very matched to Halloween. Look out! 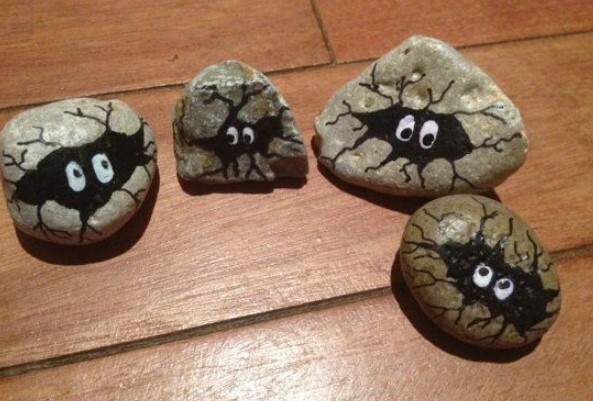 Your rocks are cracking. Look what hatched from those! I started a Group, [ Find a Rock Hide a Rock in Pennsylvania ] All suggestions are welcome. Thank You. 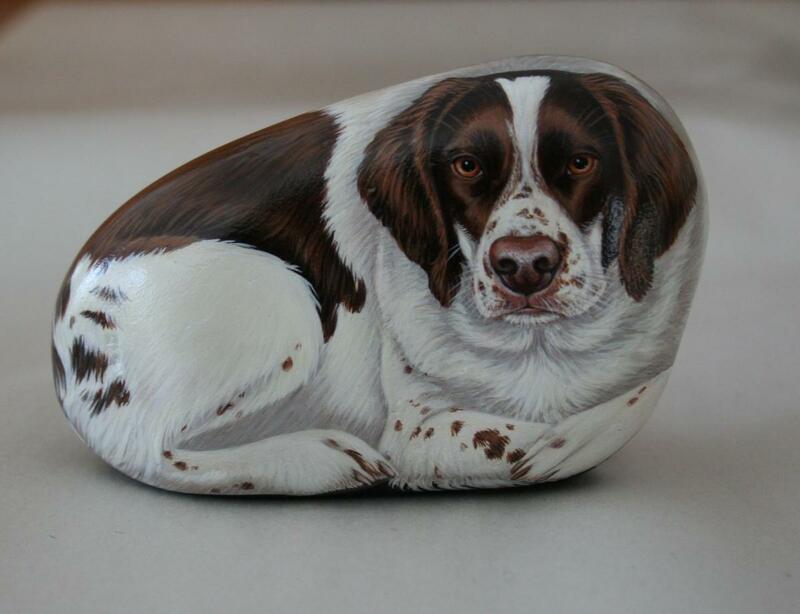 Hi I need a picture of a cute hotdog in a bun to paint on a rock please! The sunflower on your cover post was painted by me. I am flattered you chose it. 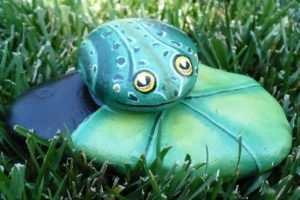 I’m new to rock painting and found this article very helpful with ideas that are simple enough for a beginner to try. Starting to feel less overwhelmed about trying something new. Thanks for taking the time to put this together. It’s wonderful!! Thank you for so many ideas in one spot. Don’t need to look for any more ideas. They are all here. I have decided to to do a flowery rock garden this .have been busy painting rocks and will sprinkle a few flowers around too. Sooo much fun ! My grandaughter is going to help too good fa ily time together !! Saw this and decided this is a fun Idea to do with my daughter. She’s 4 and loves to paint. Think we will start collecting rocks. 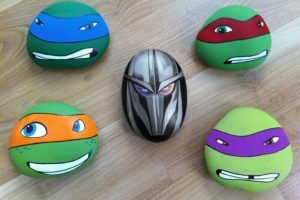 These are awesome!! Thank you so much! I homeschool my grandchildren, and always a craft person, I wanted to find something the whole family could do. 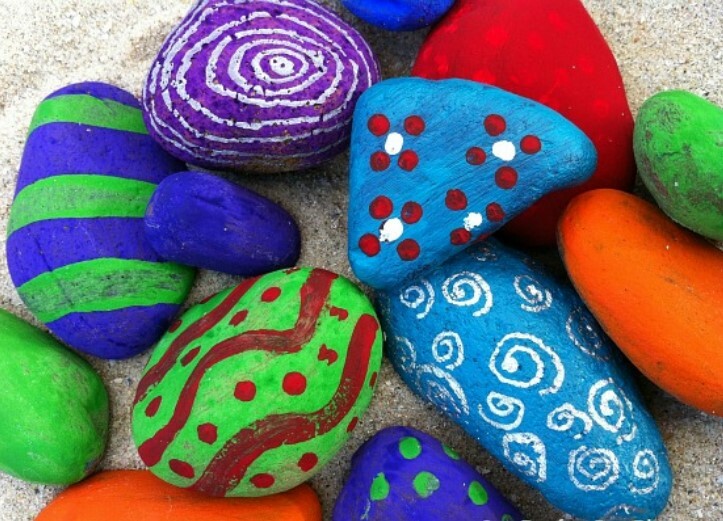 Painting rocks we’ll have art lessons, stress relief, lots of entertainment, laughter, and FUN! 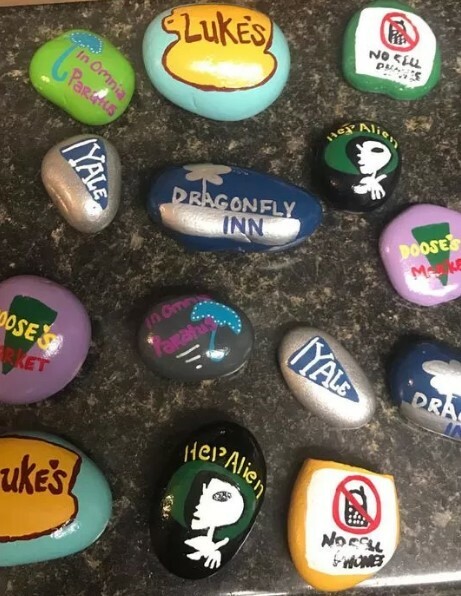 My granddaughter made some rather larger rocks, painted the Girl Scout Promise and Law on them and hid them at camp for the girls. She made up some flyers for a scavenger hunt. These are incredible, thank you for sharing! 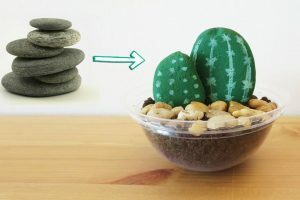 I really like these ideas and rocks. I don’t know exactly where to find rocks. I live in an apartment and do not have any rocks around except white gaged rocks. 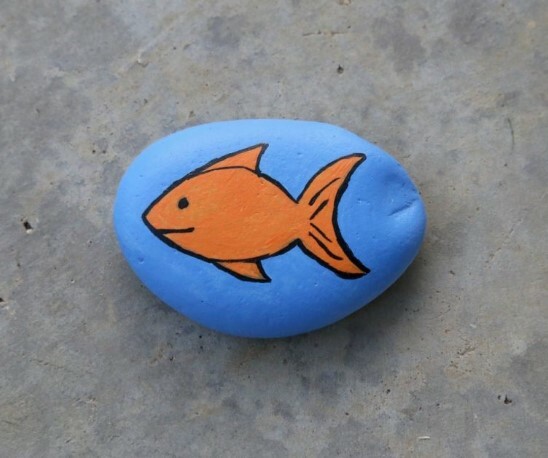 Do you have any other ideas where I can locate smooth rocks to paint? Lowe’s has a good collection of rocks that is great for this projects. I also bought some at Michael’s but was disappointed. Also, garden landscaping stores that supply rocks for borders. I have bought some small round rocks in a bag at the Dollar Tree if you have one of those around. Everything in those stores actually cost one dollar. Hope this helps. Fantastic way to spend quality time with your families. 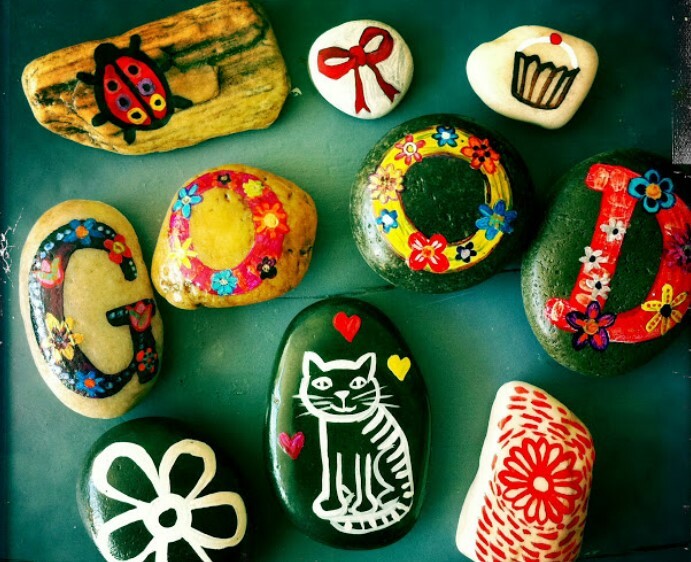 Rock painting is so much fun. You can do this year round. 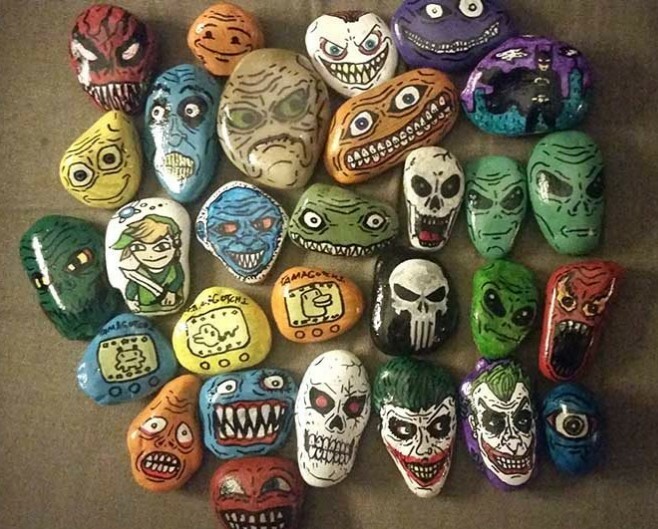 I have been a “rock painter” for years! I have painted and sold hundreds of miniature landscapes using the bumps and ridges to work into features of the scenery (tree branches, creek beds, etc). It’s slow work and I don’t get rich by any means, but it’s a unique item that people seem to love. Great ideas. Love them all! 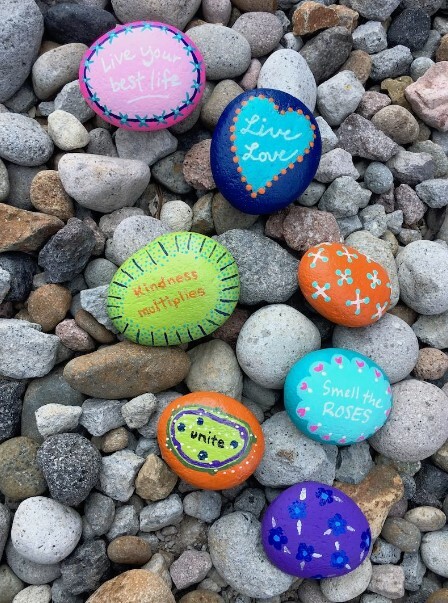 While I am flattered that you choose a rock that I painted ” April showers” to get the attention of others, I don’t like that you took a screenshot of a random painted rock to lure others into the same blog and ideas that many others use.. 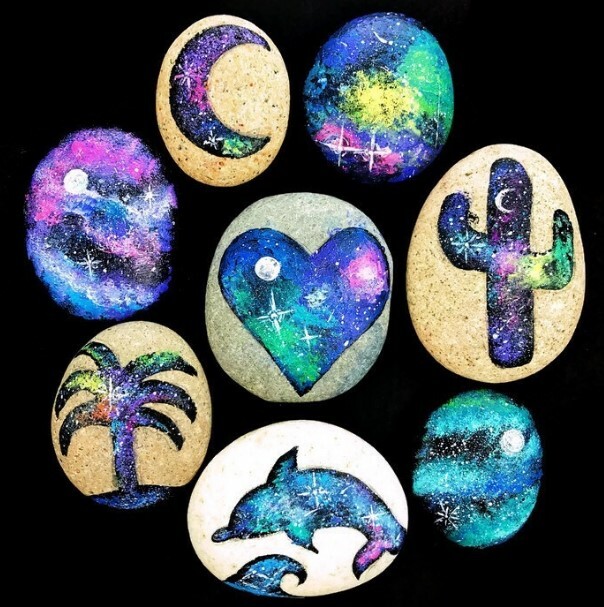 I put a lot of time and effort into the rocks I paint, and while I put them on pintrest to inspire others, I don’t post them for others to use in there blogs and stories without my permission. Please stop using photos of my rocks without my permission. Thank you. 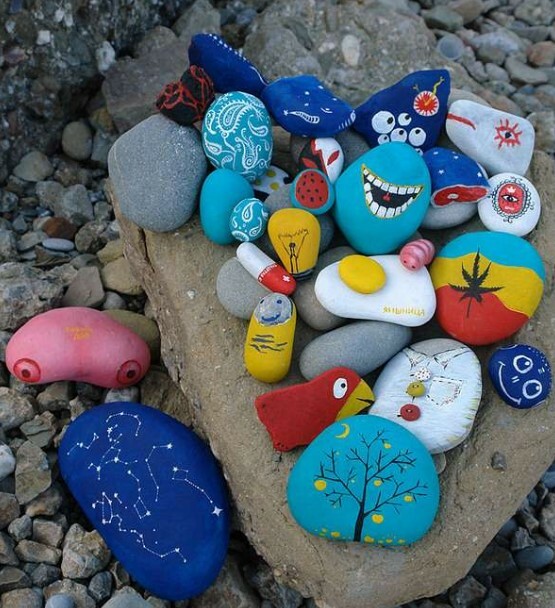 Fun Rocks! Im very inspired to get started! 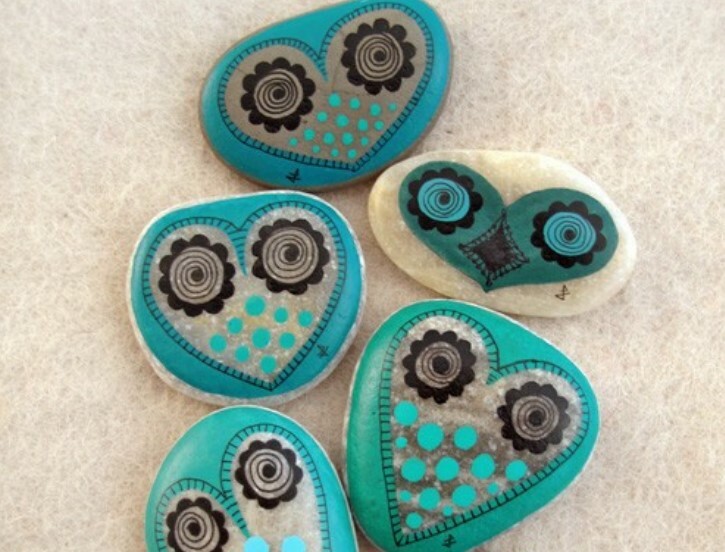 The heart with the white dots on the very front page it is the rock that I painted and put a magnet on the back. I’m very glad to see it on here. The words on the rocks on #12 don’t make any sense. Written as ( if you have such of those painting talent you can use the rocks ect.) I read it over and over again but I can’t get it. I think you maybe ment, if you have the painting talent you can. 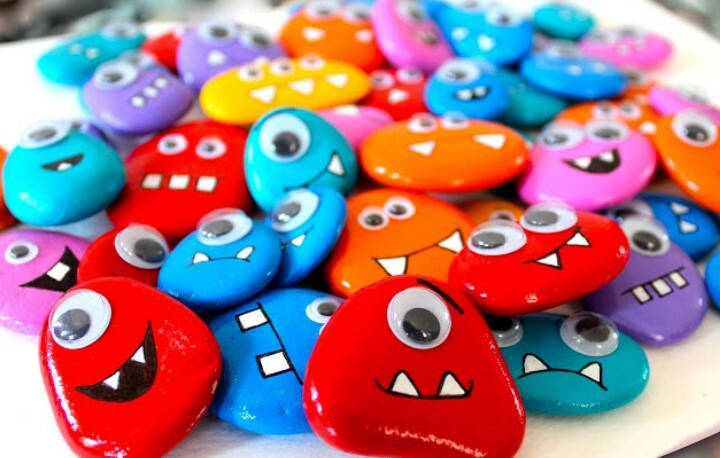 …..The rocks are beautiful, cute . Cover all ages and talent , that anyone can find something to do. Thank you for taking the time to put all of those rocks in one place, it’s so nice to have such a wonderful variety in one place ?